Did you ever want a lounging jacket? 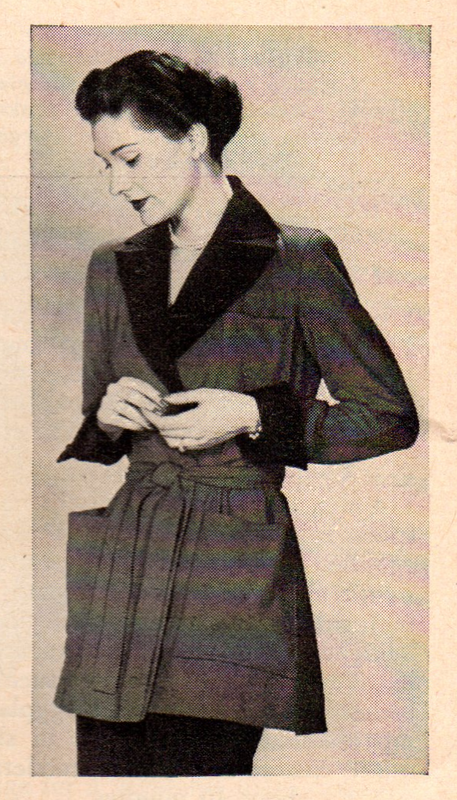 Here is an inspiring re-fashion story from the 1950s, in which a robe is converted into a elegant lounging jacket. By replacing frayed sections and adding new fabric, you have a smartly re-styled garment! Before: a "too short, red flannel robe with worn-out elbows"
The How: The sleeves, collar, and pocket facings of the robe were removed and the sleeve seams opened. Each sleeve was cut in two lengthwise, to use as a pattern for new sleeves. The robe was cut shorter, to finger-tip length. From the cut-off fabric, new sleeves were cut. One yard of black velveteen was used to make new facings (using the old as a cutting guide). 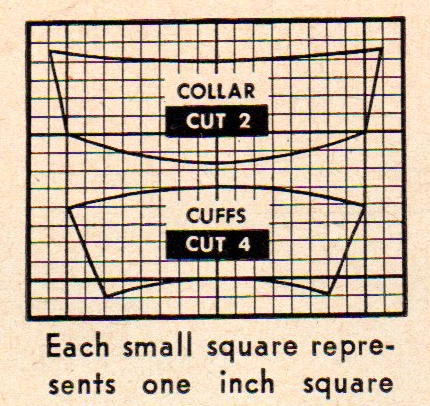 New patterns were worked out for the collar and cuffs (diagram below). Patch pockets and a breast patch pocket were made. Now if I only had enough time to lounge, and in such style!